Earlier this week, we received word that Samsung was working on an unannounced AMOLED tablet called the Galaxy Tab S. This new slate is rumored to ship in two different sizes: 8.5-inch and 10.5-inch. Pictured above is a purported shot of the latter. 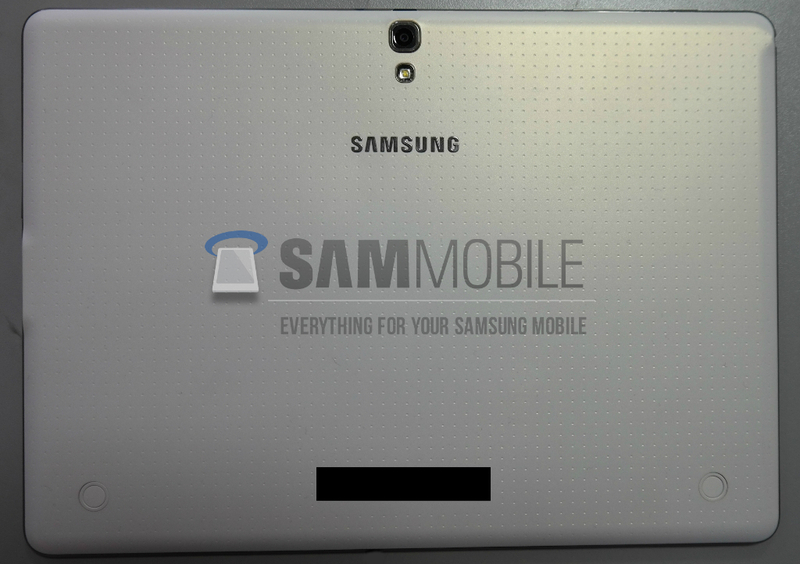 Obtained by SamMobile, the device’s appearance lines up with most of the recent rumors. At first glance, the Galaxy Tab S bears a strong resemblance to the Galaxy Tab Pro, however it sports a textured back similar to the Galaxy S5. Speaking of the tablet’s backside, check out those two nubs towards the bottom of the device. They’re reportedly special connectors for Samsung’s upcoming book cover. As a bit of a refresher, the Galaxy Tab S is rumored to feature a 10.5-inch 2,560 × 1,600 AMOLED display, an Exynos 5 Octa processor, 3GB of RAM, an IR blaster, an 8-megapixel rear-facing camera, a 2.1-megapixel front-facing shooter and Android 4.4 KitKat. Samsung’s new slate may have broken cover, but it’s release date still remains a mystery. The company already has several tablets on the market, so it’ll be interesting to see how the Galaxy Tab S fits into its already congested product line.